HABIT: Blooms in many colors, mostly from late winter through early spring. Some bloom in the fall. Leaves are basal and grasslike, often with a silver midrib. Purple, blue, yellow, and white flowers are available. Plant corms in the fall. 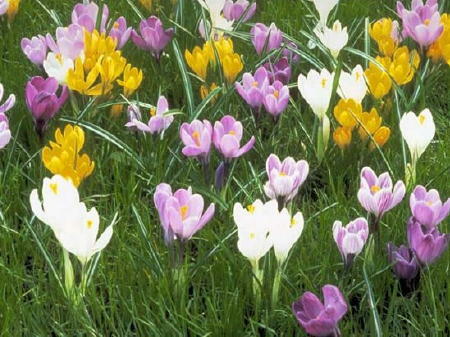 Sternbergia lutea, a yellow fall blooming crocus, naturalizes better and lasts longer than most other crocuses. Crocus sativus, saffron, blooms with gorgeous purple flowers and bright red stigmas, the source of the delicious and valuable spice. Plant in the spring for fall flowers. CULTURE: Plant in well prepared soil and use the basic watering and fertilizing program. USES: Low growing perennial color. INSIGHT: Plant and leave alone for three years. Then dig, divide and expand planting or give some corms to friends. When buying this herb ready to use, get the threads instead of powder. There’s less likelihood of adulteration.